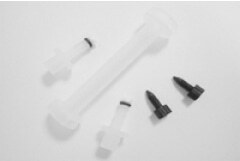 Protein Ark offers empty 1 ml, 5 ml, 10 ml and 20 ml FPLC chromatography columns at an affordable price. Both ends of the FliQ columns have 10-32 UNF threads which fits all common chromatography instruments such as AKTA. Pack your own resin into these columns. Separate your proteins using an FPLC, HPLC, low pressure pump or a syringe. Use your own resins or use our own high capacity, high flow rate resins eg Protein A Agarose, Protein G Agarose, Super Ni-NTA, Super Co-NTA and Super Glutathione Agarose resins.